So another football season has come to an end. I honestly don’t know what I’m gonna do with my Sundays for the next 6 months. 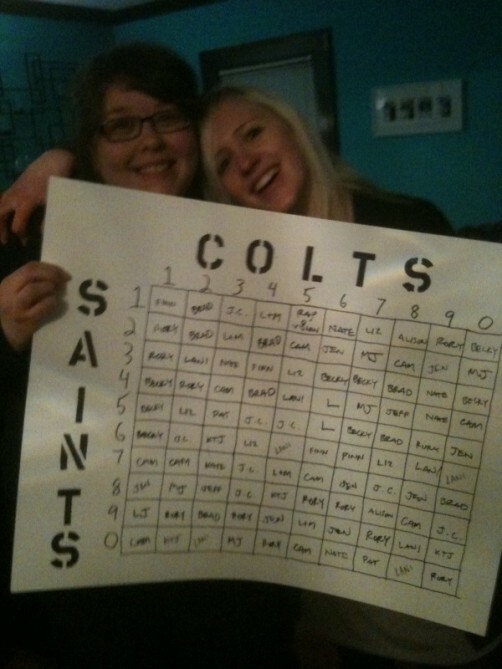 Our Super Bowl party was nutz. Think I might still be recovering actually. Roons won the first annual chili cookoff with her outside the box chicken chili recipe (there was a blindfolded taste testing judge and all). 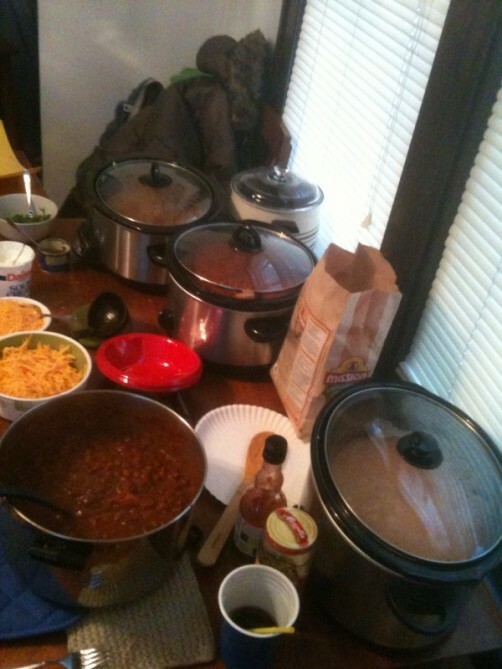 Six crockpots in total! So many foods devoured. So many (too many) brews crushed! Definitely still recovering. Below are the few pictures I managed to get of the event. I really gotta get better at remembering to take more of these in the moment. And click HERE to see an adorable video of 18 month old Finn saying “Beak” for the first time. Warms my heart. The game was awesome. I love that we’ve had a good run of close Super Bowls for quite a few years now. 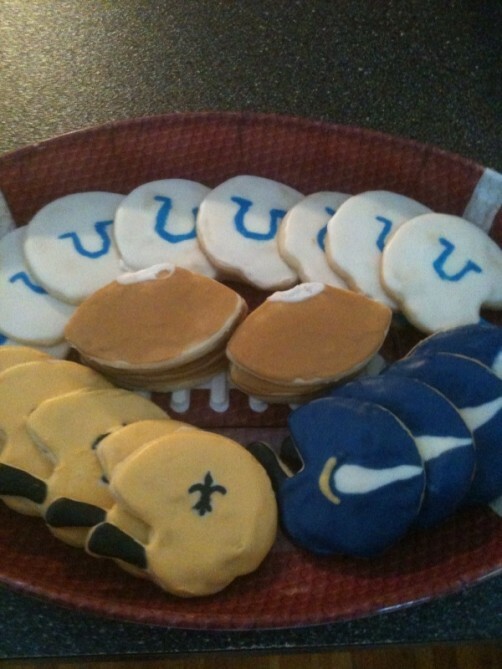 Gotta say I was pulling for the Colts, but I’m not mad at the Saints. The sting of them taking down the Vikes has subsided over time. I was really excited to rate all the new commercials too, but it turned out that most of them sucked. That Snickers Abe Vigoda one takes the cake hands down, definitely worthy of a 10 crockpot rating. Other than that though I wasn’t super impressed. The Google commercial and the one with all the kids toys driving around together were cool. All the Doritos ones were pretty much the worst except for that kid slapping the dude. The Bud Light auto tune commerical wins only because they actually got T-Pain in it singing about guacamole at the end! Overall I’d give this year’s Super Bowl commercials a rating of about 4 crockpots. I really hope they do better next year. If you’re curious or missed the game you can click HERE to see all the commercials. I actually spent all yesterday morning rewatching these to make sure I didn’t miss anything (kind of pathetic now that I think about it). Oh well. I’m gearing up to play this Rhymesayers Haiti benefit show tonight at First Ave. Guess it’s already sold out, but if you’re in the area make sure to come out to Sauce (Lake and Lyndale) on this Saturday night. 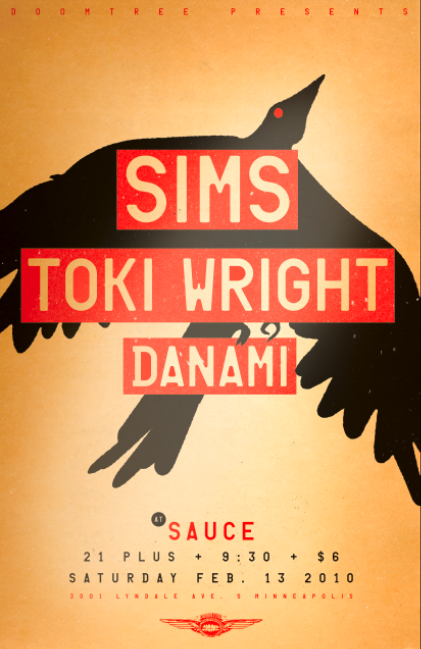 I’ll be backing up Sims, plus the one and only Toki Wright is on the bill as well as Danami. Should be a wonderful evening of good rap music. Gonna bow out with a couple Bonus Jams. I’ve been listening to nothing but Luther Vandross and Teddy Pendergrass these last few weeks. Man these two are some of the best to ever do it, absolute undeniable LEGENDZ. A sincere and heartfelt rest in peace to these incredible men. Have a sweet week. See you next Tuesday.